I blogged like I was a long winded Cina pek on this rebate program. Enough theory, now follow on with practical experience on how easy for the registration and perhaps rebate. I remember that I filled in a form with personal particulars when I bought the card more than 10 years ago. So a question here is whether you need to match the IC number with the card you bought or not. I used my IC and the registration process was pretty simple and went smoothly. The tricky part is the password, you can click on the button to see the requirements. I reckon it's too strict that each letter cannot be repeated at all. For instance, password "Rebate123" will be rejected since "e" repeats once, there are 2 "e" in the password. It should allow at least one repetition. Yoohoo! I am eligible for a rebate of RM23.74. The rebate matches my estimation in my earlier post that I should receive an average of RM20 rebate if I meet the minimum of 80 transactions every month. 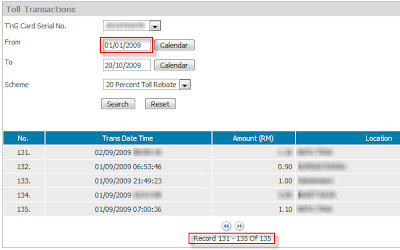 Since the rebate program begun on 1 Sep 2009, so this amount of RM23.74 should be for the month of September. 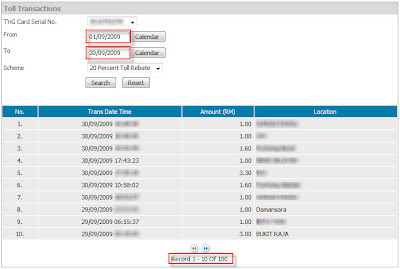 Also, I just transacted 2 tolls few hours before but the transaction wasn't showed up yet, the last transaction was dated a week ago, so I believe there is delay for the database synchronization and this could be the reason why we can only claim the rebate for current month after 5th day of the following month. There are other links to check your redemption status and whatnot, the further I explore the more questions I have. Q1. I had 100 transactions amounted RM143.30 (manual calculation) in the transaction report but over here it showed only 91 transactions of RM130.90 in the Current Rebate Status report. What happen to the other 9 transactions? What is what now? It's middle of the night now, I don't think anyone would pick up my call if I call to the customer service now. There is also a feedback link, I then submitted my questions online. Let's see the responsiveness of this company's customer service. Now from all above, the process really looks like what it claims, "no registration is required to enjoy the rebate". But I reserve my comment until I receive the rebate in few hours time later.